This trail begins at the Playground parking area. It is mostly dirt and connects to various trails that head West and North. This loop will take you along the western and eastern edges of the South Shore portion of San Angelo State Park. Most of the trails are level but there are some inclines and declines, nothing severe. Trails are composed of hard packed dirt and small rocks. Info kiosk, water and toilets are available at the playground parking area and at Burkett Park, the turnaround point. The longest single leg of this loop is the Tasajillo Flats Trail which is 1.8 miles long. 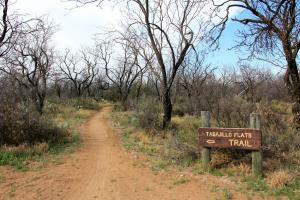 This trail meanders through mesquite trees, prickly pear cactus and open areas. The first portion of the trail is level but after crossing the road near the South Shore gatehouse, the trail changes and becomes slightly rolling terrain. This will continue for awhile before you reach another road which you cross. This final portion of the trail is mostly level, hard packed dirt. At the end of this trail, you come to a "T" which is the Nature Trail, turn left. You'll go about 100 - 150 meters before you come to another junction. Turn right and you'll be on the Nature Loop Trail. Nature Loop Trail is mostly level, hard packed dirt with lots of mesquite trees. At the end of the trail, you'll have the most severe incline of the entire hike for maybe 100 - 150 meters. When you crest the incline, which is the end of the Nature Loop Trail, you'll see the signpost for the Lankey Lackey Trail across the road. A word of caution - if you look to the right, you'll see the Isabel Harte Multi-Use Area stone sign - AVOID GOING NEAR IT. There is an active beehive inside the stonework and if you watch, you will sometimes see streams of bees going in and coming out of, the sign. Lankey Lackey Trail is mostly small rock, level is some places but mostly slight inclines. At one point about 3/4 of the way through, the trail crosses a stream which is channeled through a culvert - no wet feet!! Follow the trail to the end and when you come to the road, look right and you'll see the Burkett Park sign. Follow the road to Burkett Park where there is dry toilets, water for human and horse and a table with shade. Winding Snake trail begins here and you will take this back toward the playground starting point. Mostly level, mostly dirt trail with many open areas as well as some areas with lots of mesquite trees, this trail goes along the western edge of the dried up lake bed. Depedning on the time of day, deer are present as well as porcupines, birds, snakes and lizards. Follow this trail and at the very end it will have a left and right branch. Either is ok to take as they both terminate near the same place but I recommend the right branch for first time users. When you crest the easily hiked slope, follow the gravel road on the right and it will take you to the final trail, Chapparal Trail. At this point you are at the Isabel Harte Multiuse Area and you can see easily where the lake was and where the dam gates are. Not much to see right now though. Follow the trail through Isabel Harte and beyond as the trail goes through a former lake channel. The trail does have some shady areas as you get closer to the playground. You will walk along some picnic areas and eventually, will come to a paved road, cross and continue to follow the trail until you come to some embankments. At this point, you're at the end of Chaparral Trail, and you'll see the signpost for Talley Valley Trail straight ahead, do NOT take this. Instead, turn left along the gravel road and walk about 30 meters or so, the final leg of the Chapparal Trail is on the right. A short distance on this and you've reached the playground where you started.